Because their children won’t love them unless they can produce an Elsa dress, parents have recently begun resorting to spending thousands of dollars on Frozen merchandise on eBay. The film’s DVD release has caused a surge of demand that Disney’s supply has yet to meet, prompting hissy fits across Disney Stores nationwide, as those stores have implemented a two-item limit on what little Frozen merch they have left in stock. According to the New York Post, some parents have gotten into physical altercations, while still others have told employees their kids are sick solely to guilt them into handing over the goods. 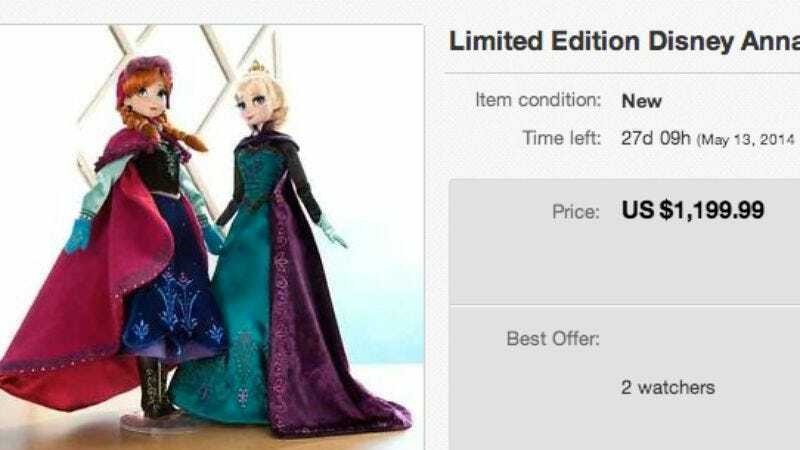 Now that craze—in particular, for Elsa dresses and dolls—has spilled over online, where some are going for more than $1,000 on eBay. Some parents have also banded together to form Facebook groups like Unfrozen Trading Friends, a forum for buying and selling Frozen merchandise without the markups. Others have adopted a more negative strategy, taking to Disney message boards to accuse the company of strategizing and planning the shortage.